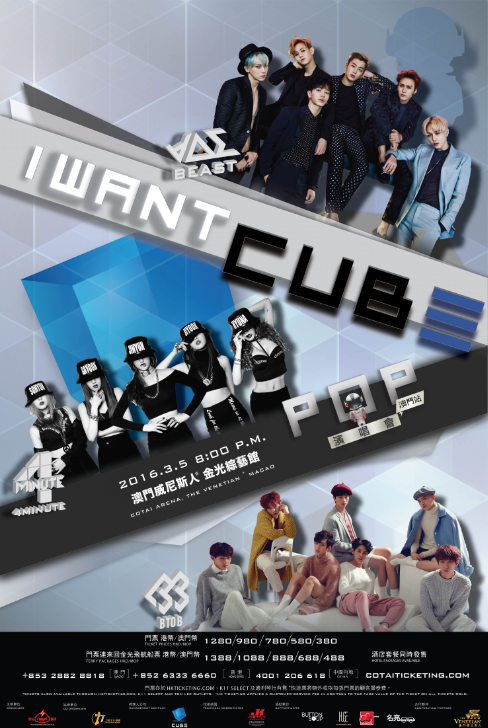 (Macao, Feb. 11, 2016) – BEAST, 4Minute and BTOB will come together at the Cotai Arena at The Venetian® Macao on Saturday March 5, 2016 for I Want Cube Pop. The star power that will come to Macao for I Want Cube Pop is a testament to the incredible popularity of K-pop around the world, and fans of the upbeat and catchy pop tunes will be treated to an astounding display of vocal talent as well as some truly staggering stage setups. The now well-known and loved BEAST is one of Korea’s most popular groups. The six-member all-male group has released eight mini albums and two full albums since they burst on to the music scene in 2009. The mini album “Ordinary” that released last year was a big hit. Seven-member group BTOB is made up of four vocalists and three rappers who come together to create a truly unique experience. With a host of awards under their belt, BTOB are a musical experience not to be missed. I Want Cube Pop will feature incredible light shows, dazzling costumes and incredible voices as three of Korea’s most popular groups come together for the show which promises to be a fantastic night. I Want Cube Pop will be held at the Cotai Arena at The Venetian Macao at 8 p.m. on Saturday March 5, 2016. Tickets go on sale for this one-night only spectacular on Friday, Feb. 12, 2016 at all Cotai Ticketing box offices. Date and Time March 5, 2016 (Sat. ); 8 p.m.
Photo caption: I Want Cube Pop will be held at the Cotai Arena at The Venetian Macao at 8 p.m. on Saturday March 5, 2016. Tickets go on sale for this one-night only spectacular on Friday, Feb. 12, 2016 at all Cotai Ticketing box offices.